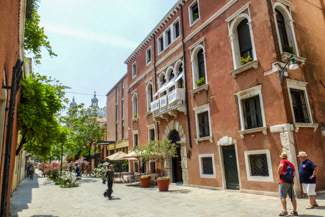 The Ca' Pisani claims to be "the first Venice Design Hotel." The definition of a design hotel may be in the eye of the beholder, but Ca' Pisani certainly would appear to fit the bill: The traditional Venetian palazzo has an Art Deco feel inside, with original furniture from the 1930s and '40s in its public rooms, guest rooms, and suites. The hotel is located just behind the Gallerie dell'Accademia, one of Venice's most famous art museums. As you leave the Alilaguna Linea Blu airport boat's floating pier at Zattere, head for the Rio Terà Antonio Foscarini, which is a wide tree-lined street that heads inland from the Zattere waterfront. Walk down the street about 100 meters, past the Hotel Belle Arti. Ca' Pisani will be on your left, in a distinctive rose-colored building with arched windows and a stone balcony on its façade. Exit the cruise terminal via the main doors and walk straight ahead to the wooden bridge. Cross the bridge and continue walking along the Zattere, which is the wide pedestrian promenade next to the Giudecca Canal. After five minutes or so, you'll reach a stone bridge, the Ponte Lungo. Cross the bridge and keep walking past two churches. Turn left just after the second church (the Gesuati). Walk inland on the Rio Terà Antonio Foscarini, which is a wide tree-lined street that heads inland from the Zattere waterfront. Follow the directions from the Zattere airport-boat stop above.